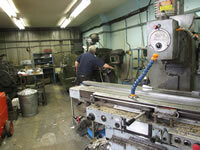 We offer conventional machining services including milling and turning for both metals and plastics. Conventional milling can be carried out using a range of machines with capacity up to1500mm x 600mm x 120mm. Our mills are fitted with DRO and set up for repetition work. Lathe work can be carried out on bar, square and hexagonal tube & section upto 200mmØ and 1800mm in length.